Ecologic Institute has committed itself towards the promotion of sustainable development through various research and dissemination efforts. However, our work does not stop there: we do not only want to promote sustainability on a political level, we also want to increase sustainability in our everyday lives – starting at the office. The project had two main goals. The first was to determine how sustainable the current operations at Ecologic Institute are, and determine where there is room for improvement. The second was to raise awareness on how certain small changes in behavior can have a big impact on the environment. Because what’s the use of providing power strips that can easily be switched on and off for every office space, if no one uses them? During the course of the project, an employee survey was conducted in order to collect ideas, suggestions and criticisms. The lively participation of our staff stressed the will for a more sustainable working environment. Furthermore, it became obvious that more communication is needed, as a lot of the already existing improvements were not known to the staff members. After an extensive analysis of the current state and the more than 100 employee suggestions, Ecologic Institute introduced some significant improvements. An important step to compensate for the information deficit was the action week that took place in July at Ecologic Institute. In the course of this week that was put together under the motto “More Sustainability in the Work Place”, the project results were presented in an internal presentation, and further information was disseminated for a more environmentally friendly work place. Labels, the availability of information at central places, and a daily quiz, which proved to be very popular, were used to increase the staff’s awareness of the issues. The program also initiated an internal book swap (and other items), as well as a movie night centered around the topic of “plastic”. We buy office, kitchen and sanitary supplies on a regular basis, and have already been, for some time now, paying attention to the eco-friendliness of the products we purchase. The greatest amount of office supplies are purchased from memo, an online shop for environmentally and socially responsible products. 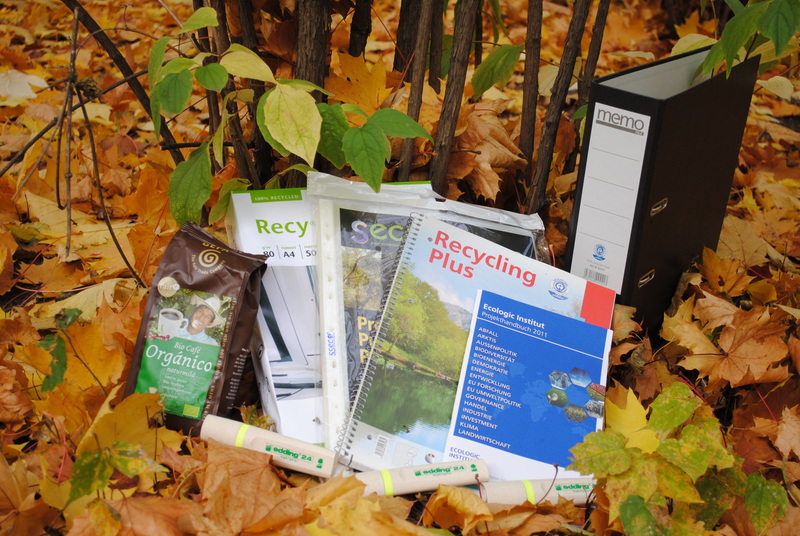 We only use FSC-certified recycled paper, energy saving bulbs, and fair trade coffee. Due to the results of the sustainability project we have now also introduced recycled paper towels, and toilet paper. Moreover, through the use of smart thermostats, green electricity, and with a majority of taps only providing cold water, Ecologic Institute has increased its resource efficiency. The catering for our in-house events is exclusively vegetarian. Furthermore, vegan catering is also possible on request due to our cooperation with the supermarket Veganz. A problem that still has to be solved is the portion-sized packs for coffee cream - an issue criticized by many of the staff members. This problem is recognized; however, due to a lack of suitable alternatives at the present time, it cannot yet be solved. Furthermore, there are still problems with the purchase of organic juice and cookies, which are not available in the desired size and quality. The topic of mobility deals with business trips and the transport choices used for commuting to and from work. Through the introduction of a Job ticket for public transport, a partly possible refund of the railway pass “Bahncard,” as well as the promotion of the contest of the General German Bicycle Association (ADFC), "Take your bike to work", the choice of eco-friendly means of transportation is being supported. In order to reduce business trips—especially flights—as much as possible, the use of video conferences is being promoted. Nevertheless, many (long distance) flights are taken, where CO2 compensations (e.g., carbon offsets) are not paid for by the public clients. As a non-profit institute, we strongly call upon those responsible to change these regulations and allow for compensation of business trips in the future, e.g., through atmosfair. The IT team of Ecologic Institute also considers the environmental friendliness of the devices they buy. We use Snom-IP-Telephones, which have very low power consumption, and wax printers. These work with non-toxic wax-based ink sticks, do not produce ozone during the printing process, and generate 80% less waste than laser printers. In addition, we use FSC-certified paper, as mentioned above. Small measures, such as making two-sided printing the default setting, and the need to release your print job through a password, also contribute to more sustainable practices. In the course of the project, every office space was equipped with a power strip that gives us the opportunity to completely switch off all devices during the night. To sensitize our staff members to the importance of energy conservation, and to remind them to use the power strips, information stickers were attached to each computer. In general, the project “Sustainable Working at Ecologic Institute” further increased the awareness of our staff members as to how sustainability can be practiced in our everyday lives. This was already a big step in the right direction, but we still see plenty of room for improvement! The project has been and is organized by the Ecological Volunteers Elena Hofmann and Ida Lübben.